Little Mrs. Married: Please pray for the Louisiana coast! This picture in today's paper made me very sad. 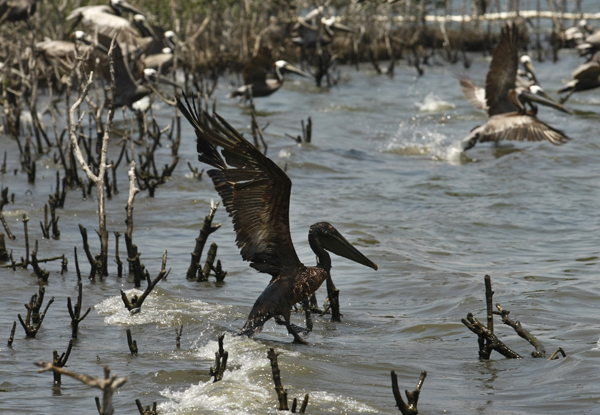 Caption: An oil soaked pelican takes flight after Louisiana Fish and Wildlife employees tried to corral him on an island in Barataria Bay just inside the the coast of Louisiana, Sunday, May 23. The island, which is home to hundreds of brown pelican nests as well at terns, gulls and roseate spoonbills, is impacted by oil from the Deepwater Horizon Oil Spill. Here is the beginning of the article "State not going to Wait": ON BARATARIA BAY. (AP) -- "Louisiana Gov. Bobby Jindal says the state is not waiting for federal approval to begin building sand barriers to protect the coastline from the Gulf of Mexico oil spill. Jindal's defiant comments Sunday came as oil pushed at least 12 miles into the heart of Louisiana's marshes. Two major pelican rookeries are now awash in crude." It's so sad & terrible. Please pray for our coastline, for our governor & for all the men & women down there working so hard to clean up that oil spill. So sad. My prayers are with these people and in hopes that this situation will resolve soon. Oh bless it's heart!! This is so sad! I was listening to CNN on the drive home yesterday and they were talking about not waiting..Good for them!! Praying for the coast!! don't forget to pray for the Coast Guard too! They get the blame and none of the fame!!! They are expected to clean but hardly thanked for what they do! It is so sad to see the oil in the ocean and watch all of these reports on Good Morning America every morning it breaks my heart!! If we can walk on the moon whay on earth can we not stop and oil spill. It is hurting tons of people. I have been praying that this will stop soon! !